Homegoing, which begins with the story of two sisters—one married to a white slaver in Ghana and the other who is sold into American slavery—is an epic exploration of the successive generations of each branch of the family: one in Africa, one in America. The result is a timely, riveting portrayal of the global African Diaspora—and the aftereffects that linger on to this day. Just 26 years old, Gyasi is remarkably humble about her success. “It’s not something that I expected and it’s been pretty incredible,” she tells The Root when we catch up with her at her Berkeley, Calif., home on a brief break from her whirlwind book tour. The Root: What inspired you to write Homegoing? 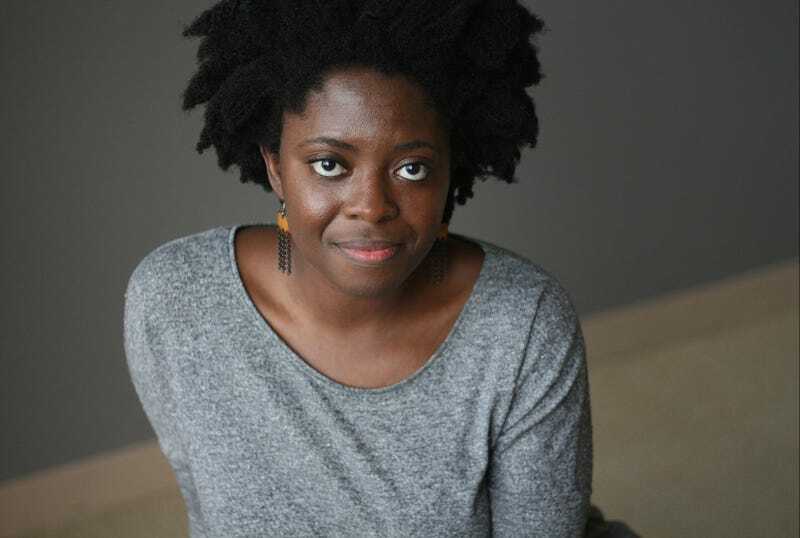 Yaa Gyasi: Homegoing was really very much inspired by a trip to a Cape Coast Castle I took in 2009. The tour guide talked to us about how the British soldiers would sometimes marry the local women, which was something I had never heard before. I was immediately struck by the idea that there could be Gold Coast women walking the upper level of this castle. Free. And then from there, the tour guide took us down into the dungeons. First of all, I couldn’t even imagine what it would be like for people to live in those spaces. They were so dark, and they still smelled. I was horrified—not just by the dungeons, but that there were people walking above them, sometimes Ghanaian-Gold Coast women. And so I started this book with those two women juxtaposed: the free wife of a British person and a person who was kept in the dungeons. It took seven years to complete. TR: What inspired you to become a writer? YG: I started writing when I was very young, actually. Very quickly, for me, reading and writing went hand in hand. I always wanted to see if I could do the thing that I was reading. The first story that I remember writing I wrote at age 7 for the Reading Rainbow Young Writers and Illustrators Competition. It was called “Just Me and My Dog.” LeVar Burton signed my certificate and sent it back and it was a huge deal for me. I was pretty much hooked after that. I was always writing little stories for myself and tucking them away. I still, to this day, consider writing as an extension of reading. TR: As a young African-American girl, did you see yourself in the books you were reading when you were younger? Were you aware of that level of representation? YG: I didn’t see myself in most of the books I was reading when I was younger. It wasn’t until I was 17 and I read Song of Solomon by Toni Morrison that I first felt that flash of recognition: Here was a woman—a black woman—writing books about black people. It really struck me. And I felt seen in that way. I really loved Morrison’s portrayal of the character Ruth. Before that, I had been reading books that were mostly by and about and, in a lot of ways, for white people. And I loved those books. I loved Jane Eyre, Pride and Prejudice and David Copperfield. I think in a lot of ways they taught me some fundamental truths about empathy and all of those things that you want your children to learn. But it really made a difference to me to read books by black people and which had black characters. And yet, it wasn’t until I was a little older that I first encountered that and realized that was something that I did want—that I could want. TR: It’s interesting that you mention character, because the characters you write are so rich and well-drawn. How do you write such compelling, complex characters? YG: Character is really important to me. For me, it is the thing that makes or breaks a book. What makes me feel as though I’m inside of the book or pushed out of the book is whether or not I can believe a character can exist in the real world. Because of the subject matter, I didn’t want this to be the kind of book where people could feel as though there are villains and heroes. I wanted each character to be really nuanced and complex and show a range of possibilities, a range of moral complexity. TR: Where was your childhood like? YG: I was born in Ghana, and I left when I was 2 years old for my father to get his Ph.D. in French. I don’t have any memory of my time in Ghana. We only went back once as a family when I was 11, and then I didn’t go back again until that trip in 2009 that I took by myself. I think my parents really wanted to foster a sense of Ghanaian community when we came to America. When we lived in Columbus, Ohio, it was easier because there was a large Ghanaian population there and we were members of the African Christian Church, which was half Ghanaian, half Nigerian at the time. We were very much plugged into the Ghanaian community there. It got harder when we moved to Alabama because there were fewer Ghanaian families around, but I think it was really important to my parents that we feel like a Ghanaian household and not completely blend into America. They made the food—my mother is a great cook who still mostly cooks Ghanaian food. We didn’t speak the language—my older brother and I understand the language: As we grew up, our parents would say something in Twi and we would answer back in English. TR: What was it like being an African growing up in America? YG: By the time we moved to Alabama, I was 9 and we lived in predominantly white areas, and my school was predominately white. It was very difficult. I think it would be difficult for anyone feeling the daily microaggressions of racism. You started to really feel different. Racism was more subtle, less overt. It wasn’t like I was called the n-word. It was comments like I only got into Stanford because I was black. Or that I would never find a boyfriend because black men are this way or that way. Things like that. We never had a lot of community with other black Americans in the beginning, either. We experienced a kind of distancing from that community—both in terms of the way we were raised and being called names like “Africa” or being told that, “You talk like a white person.” It wasn’t until I got to college that I began to seek out connection instead of separation. I started thinking about things like Diaspora broadly and to feel more connected to blackness across the board, not just as an African immigrant but as a black person in America. TR: What do you want readers to take away after reading your book? YG: I hope that the thing that this novel contributes is the sense that all of these horrific things that happen in these traumatic moments in our history happened to people, and not to a faceless mass. I hope that this book makes these kinds of moments more intimate and helps us feel empathetic toward people.